The North Korean state claims that US troops arrived in Sinchon, Hwanghae province, on 17 October 1950 and promptly began butchering civilians, culminating in over 35,000 dead by the time of their retreat on 7 December. To my knowledge, no serious writing outside of North Korea has been made to determine if the body count is accurate. However, writers and scholars like Hwang Sok-yong and Kim Dong-choon, respectively, have engaged in efforts to describe the violence as more communal in nature. In other words, this was a case of Koreans killing Koreans in the fog of war, not an American attempt to wipe out an entire county of communists through medieval methods. North Korea has pumped significant resources into a refurbished museum in Sinchon and has increased its output of international propaganda about the massacre in recent years, but the narrative remains the same, and the state is extremely unlikely to open up its historical archives for external researchers. Why, then, should we still try to verify any aspects whatsoever of the North Korean account? Because the North Koreans continue to believe their version of events, and “our” version of events is hardly clear. By using sources available to researchers in South Korea, London, and Washington, D.C., I propose to get closer to understanding what happened — and what could not have happened — in and around Sinchon in the fall of 1950. First, the North Korean narrative claims that the Americans arrived in Sinchon on 17 October 1950. I have yet to find any evidence of an American unit entering Sinchon county, but, if the troops arriving were in fact British, the day of the arrival appears to be plausible. Roy E. Appleman’s standard official history of the US Army in the Korean War describes in some detail the US/UN advance north. (Appleman’s book is available in full as a free pdf. ; the following page numbers refer to the 1961 print edition.) After the Inchon Landing of 15 September 1950 and some notable internal US/UN debate about the course and purpose of the war, it took a couple of weeks to fight north of the 38th parallel. A map of some of the major cities / battlefields discussed in this post, via Google. Appleman describes how the battle for Kumchon ended with a North Korean defeat about 20 kilometers north of Kaesong on 14 October. This was the opening of a floodgate north for the US/UN forces. The full invasion of Hwanghae province promptly commenced. Forces raced for Haeju/Ongjin in the south of the province, and Sariwon further north. Sariwon was a crossroads and seen as the gateway to Pyongyang. 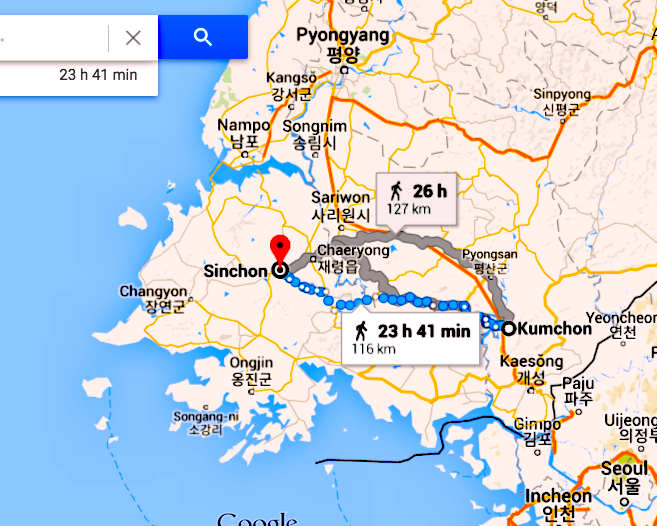 Sinchon had been noted by MacArthur’s staff as being of minor importance (more on that in another post), and was off of the main invasion route from the south toward Pyongyang. 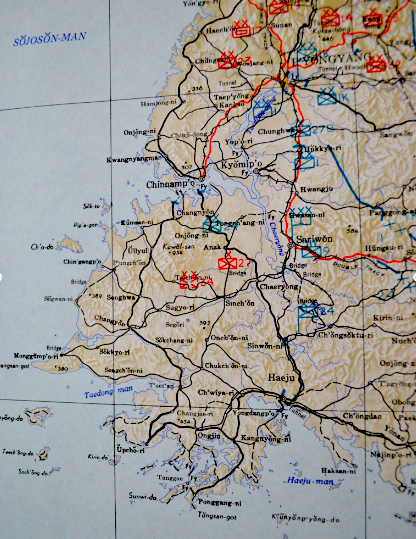 However, it was only about 35 km south of Sariwon, the main goal of US and UN fighting units, and 15 km from Chaeryong, which was the main route of the invasion of Sariwon. In sum, it was off of the main route of invasion, but close enough to be of interest to US military commanders. It is difficult to adequately convey just how quickly North Korean state structures evaporated in Hwanghae province in mid-October 1950. Haeju [海州/해주], a major administrative center along the coast and a key of strong DPRK military build-up in 1948-1950, fell to US/UN forces in a single afternoon (October 17), having been defended by only 300 North Korean troops (Appleman p. 642). British veteran and military historian Antony Farrar-Hockley goes into greater depth about Sariwon on pages 241-45 of his book The British part in the Korean War. Vol.1, A distant obligation . The British historian describes the level of resistance en route to the city as being extremely thin, consisting of a handful of snipers who were all rooted out in short order, and a skirmish in an orchard. The US/UN forces were picking up large numbers of surrendering Korean People’s Army soldiers. Appleman (p. 646) describes how the fall of Sariwon promptly put 1700 KPA soldiers and thirteen female nurses into the hands of the US/UN forces. All of this surrounding action, and in particular the role of captured North Korean soldiers, seems to play little if any role in contemporary DPRK narratives of the Sinchon massacre. These elements are deemphasized in favor of discussing a handful of resistive guerrilla elements in the countryside around Sinchon (UK intelligence appears to have estimated that there were about 2600 North Korean troops scattered around Hwanghae in late November 1950). However, at this point of the war, if there were indeed Americans or British troops in Sinchon, they certainly would have had captives from the KPA 19th or 27th armies, and would have needed to manage that population as well. Situation Map No. 11, 20 October 1950, in ‘Situation Maps, Historical Section of the Cabinet [Top Secret],’ War Office file WO308/57, United Kingdom National Archives, London. It appears that the closest troops to Sinchon were the US 19th Regiment of the 24th Division, who had been ordered by General Frank Milburn to take up a position on the left of the 1st Cavalry and advance on Sariwon from the south. I have yet to dig into the relevant documents in the US National Archives for this regiment; Bruce Cumings has previously said he has found nothing in the archives about a US occupation of Sinchon, but that doesn’t mean the papers don’t exist. In the National Archives of the UK in London, I have gone through several ‘War Diaries’ describing postings and positions of British forces during this phase of the war. These sources have not provided me with anything like full clarity on the question, but they certainly indicate the speed and temporary nature of the occupation of the North. Far more useful have been the operational maps, which, for the study of Sinchon and Hwanghae province more generally, go well beyond the level of detail described by Appleman and Farrar-Hockley, both of whom, like the troops they studied, seemed breathless to get to Pyongyang. And that is the precipice upon which I shall conclude this post.